The first part of a four part series covering the air campaign in Syria and Iraq. 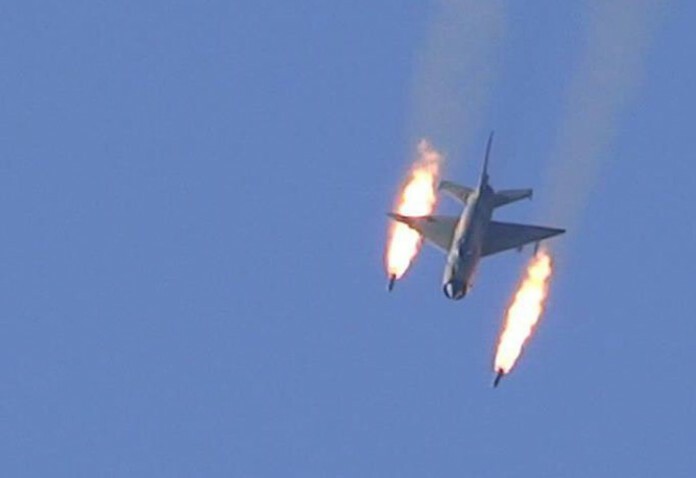 A Syrian MiG-21 firing unguided rockets at rebel position. 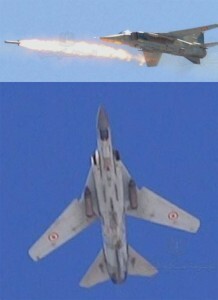 During the four year civil war the Syrian Air Force was used extensively against civilian targets. Using mainly unguided ordnance, aircraft often operate at low altitude and suffer heavy losses. Air power has been a key factor in the recent civil wars in Syria and Iraq. 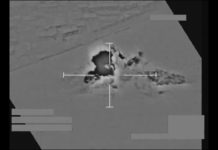 Air attacks were directed against the self-proclaimed Islamic State (IS) or known as ‘Daesh’ that seized significant areas in these countries. Its rapid growth and victories over the weakened Iraqi and Syrian regimes drew international response in both theaters. 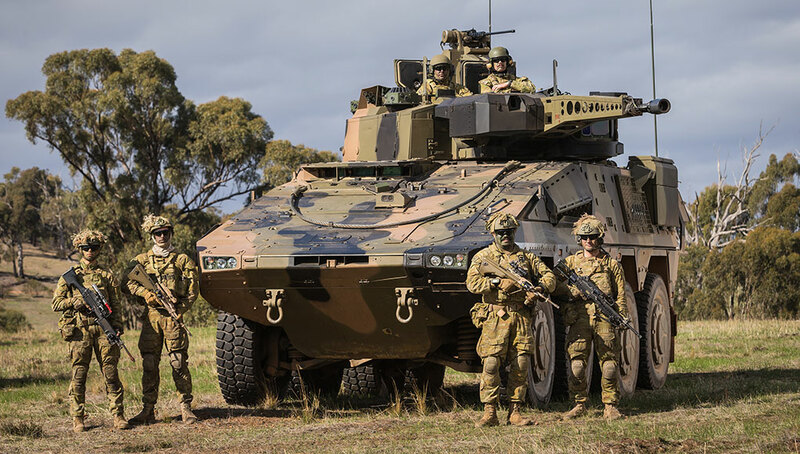 However, unlike the direct involvement of the Superpowers in the 20th century, military interventions in the 21st century are so far limited to the assistance of local forces, by training, equipping and air support. This strategy was first tested in Libya and is now employed in Iraq and Syria, by US forces in Africa and by the Russians in Ukraine and Syria. It has not been the case in Yemen and Central Africa where Saudi-led Arab coalition is fighting in Yemen, and French forces are directly involved in the fighting in Mali. An international coalition led by the USA and Arab nations supports the Iraqi government in its fight against Daesh; while in Syria. The same coalition is active against this group as well as the Khorasan, an extremist jihadi Islamic group. The massive Russian intervention that began in October 2015 has changed this ‘Daesh focus’, as the Russians are primarily supporting the Syrian government in its fight against all rebel forces. While 65 countries are supporting this war effort, only 8 are directly committing air power to the campaign. Since the interests of the regional powers like Turkey, Saudi Arabia, Iran and the Gulf States are different from those of NATO and Russia which are carry the weight of the air campaign. 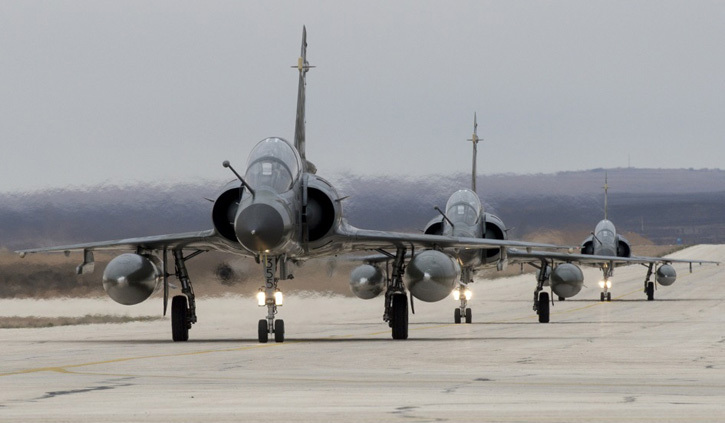 Therefore, while the air forces are cooperating with each other, the governments are not always ready to shoulder, particularly where access to their air bases and overflight permissions are concerned. Syrian MiG-23 / 27 Flogger E are used by the Syrian Air Force for ground attack, carrying bombs and unguided rockets. The Syrian theater is of particular concern, as the entire theatre is considered ‘contested airspace’. 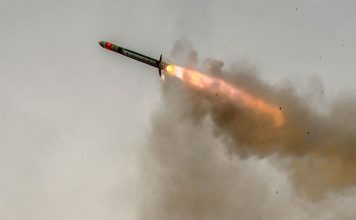 Despite four years of extensive conflict, the Syrian military still possesses substantial air defense and air force, and electronic warfare capabilities. Therefore, operations of combat support elements, such as refueling aircraft, command & control and electronic attack is limited. Due to the size of the country and distance from operating bases used by the coalition, the endurance of strike packages over their targets is quite limited and therefore they tend to attack known targets rather than prosecute targets of opportunity by short ‘sensor-to-shooter’ cycles often employed over Iraq and Afghanistan. Considering those risks, the US Air Force employed its F-22 Raptor fighters to launch the opening strikes of Operation Inherent Resolve (OIR) in September 2014. 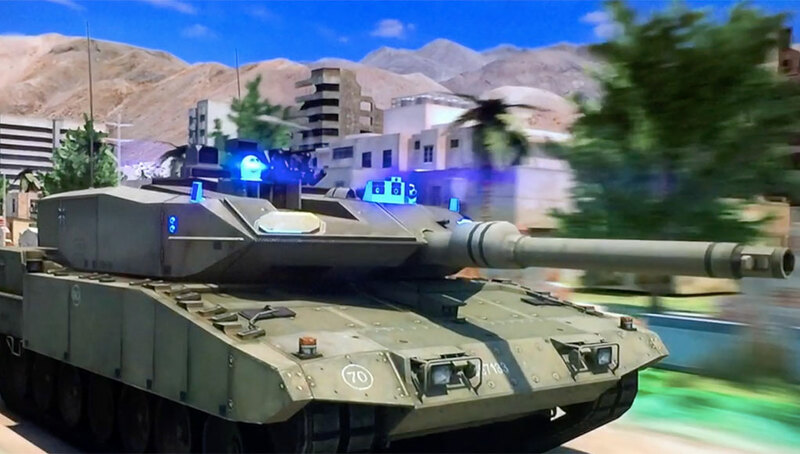 It was the first combat missions for the Raptors. These 5th generation stealth fighters were used to to safely probe the Syrian airspace and set the operating rules, without the need to consult and coordinate the attack with the Syrian and air force. Based in Al Dafra airbase in the UAE, F-22s are also used on other operations on demand. 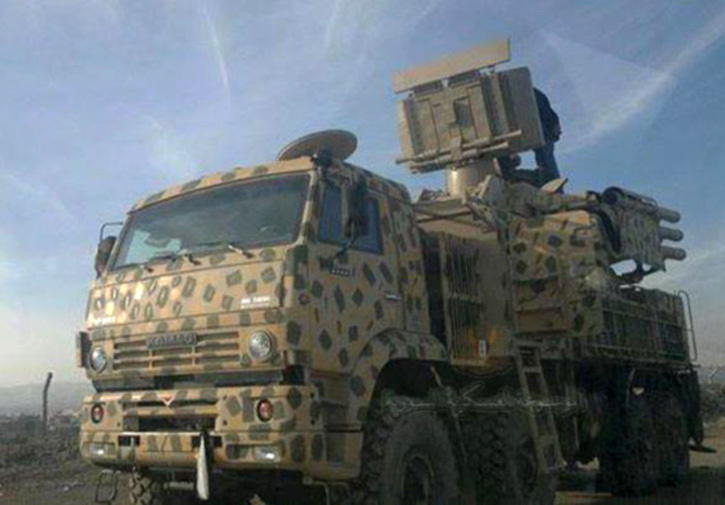 The Syrian army has recently received the SA-22 Pantsir S1 from Russia. The missile is also deployed by the Russian forces positioned in the country. Apart from the air defense assets operated by the Syrians, some of the rebel groups, have obtained Man Portable Air Defense missile systems (MANPADS) looted from military facilities abandoned by the Syrian Army or obtained from the Libyan theater. Small and medium caliber anti-aircraft weapons, primarily Russian 23mm cannons also fell into rebel hands. Both weapon types pose significant risk to low flying aircraft, particularly attack helicopters (AH-64 operated by coalition forces, and Mi-28N operated by the Iraqi Army). Close air support aircraft such as the A-10C and Su-25 are also at risk, when flying rocket and gun strafing runs at low altitude. The target areas in Syria and Iraq are far from each other. Those in Northern Syria stretch along ‘Daesh land’ along the Euphrates valley in the East, with the main concentrations at Dir Ez Zor and Ar Raqqa. Along the coastal area hot spots are located in the North West, where Turkish supported rebels are fighting other Islamist groups. Homs and Palmyra in the center are other Daesh concentrations, while others are located in Damascus area, in the South West and along the Jordanian and Iraqi borders in South. To best serve those targets, multiple forward operating bases are employed. 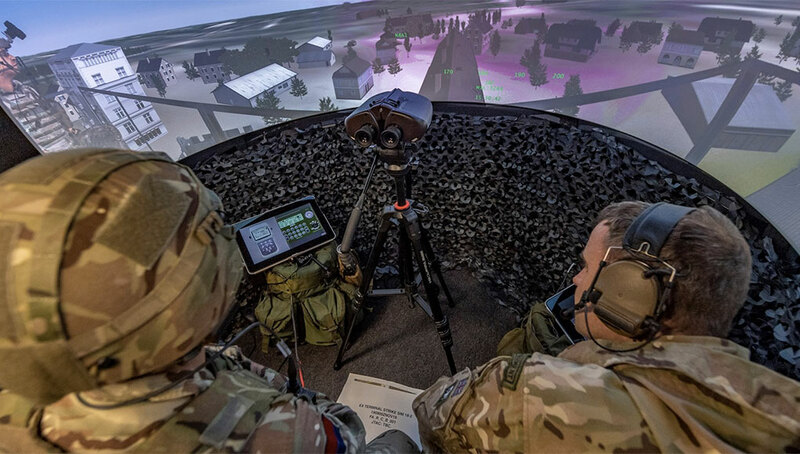 Flight ranges from operating bases in the region to targets in Iraq and Syria vary from few dozens of miles from air bases in South Turkey to the north of the Syria, and few hundreds of miles from RAF Akrotiri in Cyprus to targets in Western Syria. However, the shortest paths must pass through SAM protected areas in Syria, recently bolstered by Russian SAMs. 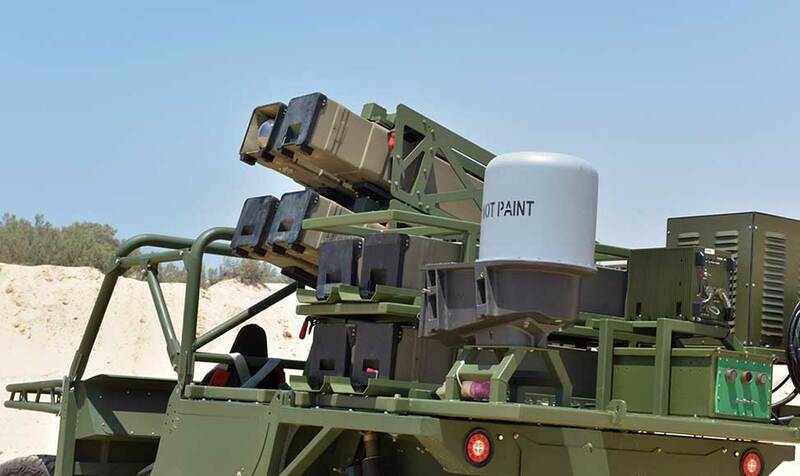 Key locations in Syria are protected by Pantsir S1 (SA-22) and SA-17 Buk 2M SAMs, which are especially lethal against aircraft flying in low or medium altitudes. THere are also older SA-8 Gecko mobile air defense systems, some reportedly fell into rebel hands. 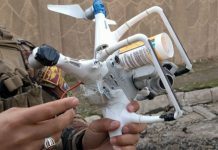 Coalition forces have lost several drones over Syria, an F-16 of the Royal Jordanian Air Force was also lost, its pilot captured and killed by Daesh. Two years ago an F-16 of the US Air National Guard crashed in Jordan, but official sources did not attribute this loss to combat actions. Azraq Royal Jordanian Air Base is also located about a hundred miles from some of the targets in the South East Syria is best positioned for those operations, and was occupied by French, Dutch and US combat elements, besides the Jordanian Air Force F-16s based here. Other bases located throughout the Arabian Gulf – in Kuwait, Qatar and the UAE stretch the flight over 500 miles or more to the nearest target, and, therefore serve mainly forces assigned to the Iraqi theater. However, the relatively permissive airspace over Iraq enables the deployment of aerial refueling. Air power, deployed from aircraft carriers in the Red Sea and Eastern Mediterranean also launch strikes at targets in Syria and Iraq. Those carriers based in the Arabian Gulf are also tasked with missions over Iraq. Currently positioned at a striking range from Syria and Iraq are the French aircraft carrier Charles De Gaulle stationed in the Red Sea and US 5th fleet carrier Harry S. Truman, that has entered the Persian Gulf in December. The Truman will remain in the area until June 2016. Previous missions involved the carriers USS George H.W. Bush, Carl Vinson and Theodor Roosevelt. 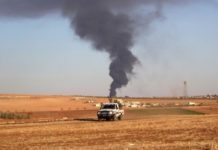 While the number and status of Syrian air force and air defense forces is not clear, Iraq is just beginning to rebuild its air force, devastated during the 1991 and 2003 wars. Today the Iraqi Air Force is gradually developing an air combat muster, although these capabilities are slow do evolve. In July the first of 36 F-16s fighter jets supplied by the US began to arrive in Iraq, stationed at Ballad airbase north of Baghdad. Prior to the delivery of the American jets 2014 Iraq also received By September these jets performed the first strikes. The Iraqis have also obtained seven Su-25 from Iran and Mi-28NE attack helicopters from Russia, operated from the Imam Ali airbase in Southern Iraq. 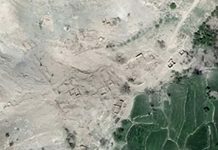 The nearby Kut Al-Hayy airbase provides the operating base for the new Iraqi drone unit, equipped with Chinese CH-4B armed drones. 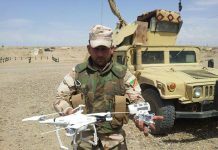 Chinese CH-4B unmanned aerial vehicle delivered to Iraq in 2015. The drone can carry up to six weapons under its wings, at a maximum total weight of 350 kg.